Located in the heart of Drayton Valley, Three Knights Steakhouse & Pizza brings exactly the passion for cooking you desire in your dining choices. Family-owned since it first opened in 1978, what ever dish you select you will not be disappointed and will want to come back again and again. Quality is never an accident, but the result of high intention and sincere efforts. This is the motto that the Three Knights Pizza & Steakhouse was founded on more than 30 years ago. Constantine “Connie” Kazoleas moved to Drayton Valley, Alberta in 1958, at the spry young age of 25. He and his brothers Jim, Peter and, later, Emmanouil first built the White Bull Restaurant, one of the community’s original restaurants. Drayton Valley was a bustling oil and gas boomtown that sprang up almost overnight. It was years before the first streets were paved - a true frontier community. It was 20 years later that Constantine, Peter and Jim built the Three Knights, which opened its doors in November, 1978. It was one of the region’s premiere fine dining establishments, building a strong reputation of excellent steaks and unparalleled pizza. Connie believed in three rules for a restaurant - Great Food, Good Service, and a Clean Place. Over the years, the two brothers moved on to other ventures but Constantine stayed on and where his brothers left, his own family moved in to help. Wife Ruth ran the books, daughters Donna and Christine worked in all position and son Tony worked in the kitchen. Connie passed on in 2006 but the restaurant remains a true family business. Even now, another third generation can be found helping out in the front and in the kitchen. as can their in-laws. Over three decades later, Connie’s motto and three rules still guide the restaurant’s owner, managers and staff. You can still get some of the best pizza and Triple ‘AAA’ Angus steak in Alberta right here in Drayton Valley, at the Three Knights Steakhouse and Pizza. Let Three Knights take care of your Easter, Thanksgiving or Christmas holiday meal with our Ultimate Holiday Feast. 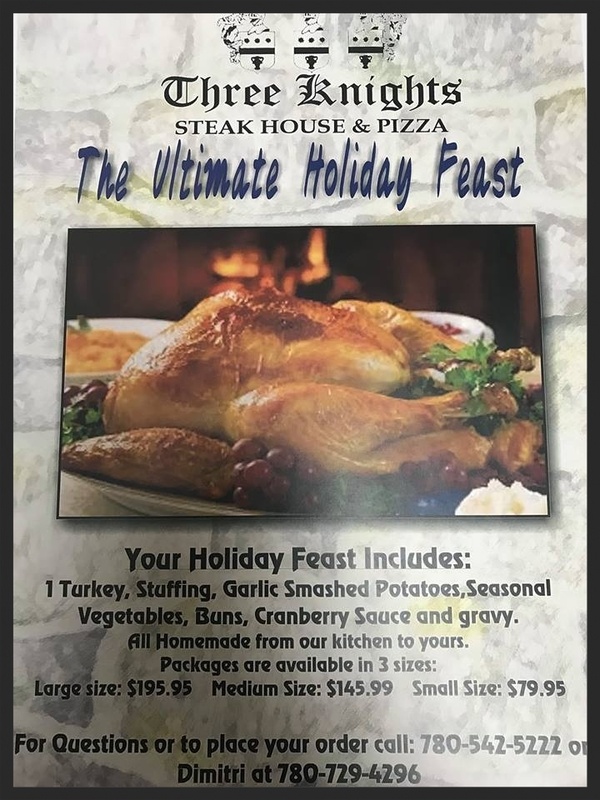 Includes a full turkey or Prime Rib cooked to perfection, garlic smashed potatoes, seasonal vegetables, buns cranberry sauce and gravy, all homemade from our kitchen to your table. Turkey Feast Packages are available in three sizes - Large, Medium and Small. Prime Rib Feast packages are available in Full or Half Rack. A great place to get away from the office and relax for an hour! 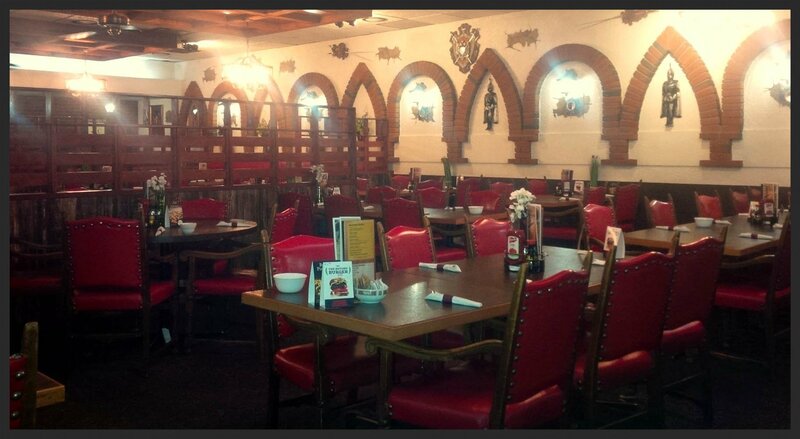 Special events, family gatherings, corporate luncheons and business meetings. We can do it all!